We are still looking to contact Anil Mendiratta – if anyone knows of him please email editor@oldcottonians.org THANKS! Mrs. Goss and I feel greatly honoured that you still remember us and have been so kind as to invite us to your Golden Jubilee celebrations. Believe me, there is no place I would rather be, but distance is an insurmountable obstacle for a “buddha” like me who will be turning 90 in another few weeks (3rd May). Mrs. Goss is throwing a party in our condo to celebrate the occasion , and, O, how I wish all you OCs could be there to make our joy complete. Mrs. Goss and I wish you every success as you proceed with plans for your Golden Jubilee. Kindly convey our very best wishes to all present. I am sure it will be a grand affair. I am not very good at it, but I will try to attach a few recent pictures taken at our 60th wedding anniversary on 7 Jan, 2018. I am sorry I don’t have the facility of sending therm to you on your Whatsapp. PS. Picture 1: Mrs. Goss & me with our daughter Cheryl and her husband Randy, Cheryl was born in BCS in 1960 and celebrated her 59th birthday yesterday. Picture 2: Mrs. Goss & me with 2 children, 5 grandchildren, 6 great-grandchildren and 4 in-laws. This entry was posted in Post and tagged 1970 Batch, 2020, Get together, Reunion on March 21, 2019 by admin. BCS Batch of 1969 – looking good! DM Sister (Neena Sood), DM Wife (Meenakshi Sud), Ishita Kahlon, Mrs. Mukerji, Kitty Khanna, Mr. Nat, Sangeeta Sawhney, Sareena Sachdeva, Mrs. Sehmbey, Kamini Mehta. 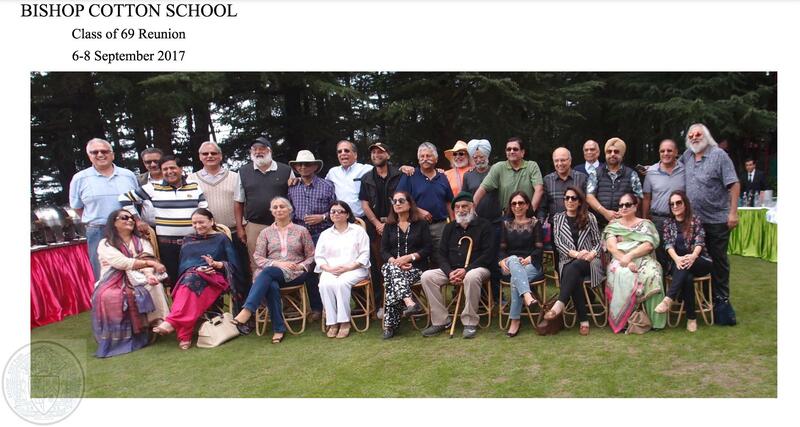 1969 Batch get together at Simla for a wonderful reunion 48 years after leaving the school gates. Three Cheers! This entry was posted in Events, News, Post and tagged 1969 Batch, 2017, Get together, Networking OCs, Reunion, Simla on September 6, 2017 by admin. The batch of 67 is holding it’s reunion in school between September 23-25. From a total strength of 36 we have 18 on board and are trying to contact others. Any one having contact details of our batch do inbox the same. Thanks guys. This entry was posted in Events, Post and tagged 2017, Batch 1967, BCS, event, Reunion, Silver Jubilee on July 12, 2017 by admin.